Missouri Aldi fans, it is time to celebrate, because Aldi might just have gotten closer to your doorstep. There is a new Aldi opening in Rayton, Missouri tomorrow Thursday September 1, 2011. 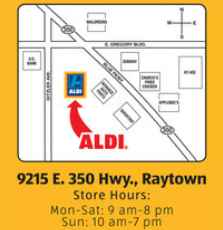 The new Rayton, Missouri Aldi Store is located at 9215 E. 350 Hwy., Rayton, MO.